Hi, I’m Jeff Darcy. 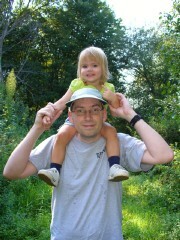 That’s me in October 2006, with my daughter Amy (then two) on my shoulders. I’d put up a more recent picture, but I can’t find any I like better and I haven’t changed much since then so it’ll do. Here’s some other information about me. Born April 26, 1965 in Candandaigua NY. Moved to New Zealand before I remember much of anything. Came back to the US (Detroit area) in 1979, finished high school, went to University of Michigan in 1981. Moved to Massachusetts in 1989. Met Cindy (my wife) in 1990, married in 1996, Amy arrived in 2004. As a software engineer for two decades I’ve worked in many different areas, but my specialties are: kernel hacking (especially filesystems); concurrent and distributed systems; and tools to verify correctness of code. Without giving a complete resume, here’s a quick rundown of the various things I’ve done. ICT (Ann Arbor, 1986): word processor for Amiga/DOS/Mac/IIgs. TCI (1989-90): DECnet on Mac/PC/UNIX. Encore (1990-92): SMP UNIX and hard real-time. Clam (1992-95): high-availability clustering for AIX. Dolphin (1995-97): high-speed interconnects. Mango (1997-98): network filesystem for Windows 98/NT. EMC (1998-2002): cluster and wide-area filesystems. Revivio (2002-2006): continuous data protection. SiCortex (2006-2009): HPC storage and networking, Red Hat (2009-present): cloud filesystem. Well, I don’t have nearly as much time for those as I used to, what with having a family and working at a startup. At various times I’ve played volleyball and soccer, snowboarded and hiked. Nowadays I mostly just exercise on the stairclimber at home or elliptical at work. I don’t read as much as I used to, but probably still more than most. On the fiction side I like fantasy (e.g. Greg Keyes, Joe Abercrombie) and offbeat humor (e.g. Christopher Moore, Jasper Fforde). On the non-fiction side science in general is tops, especially ecology and/or intersections with the social sciences (e.g. Jared Diamond, Laurie Garrett, Carl Zimmer, Mark Kurlansky). I’m also semi-active writing and debating current political issues, so many of the books I read relate to those (e.g. Fast Food Nation, High and Mighty, Ghost Wars, Natural Capitalism). Otherwise, just browse around a bit and it will soon become pretty clear what I’m about. Enjoy the site.